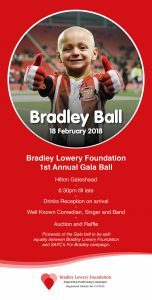 The Bradley Lowery Foundation are pleased to announce the official Launch of The Bradley Lowery Foundation by hosting a prestigious Gala Ball at the Hilton Hotel in Gateshead on the 18th February 2018. Guests will range from Local Business’s to football clubs from around the area. Funds raised on the night will be split 50-50 between the Bradley Lowery Foundation and the joint SAFC project #ForBrad campaign to build or renovate a house for poorly children to enjoy when they are not in hospital. Tickets for the Gala Ball can be requested by emailing emailing – contact@bradleyloweryfoundation.com. Tickets are £1000 per table of 10 or £100 per person.